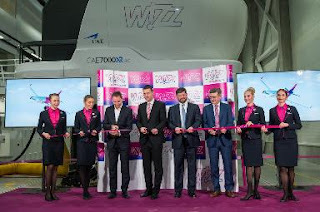 Wizz Air, one of the fastest growing airlines in Europe, plus the leading low-cost carrier in Central and Eastern Europe, opened of its new, 3,800-square metre state-of-the-art Training Centre in Budapest, Hungary during the last week with an official opening ceremony marks an important milestone in the history of the airline. Wizz Air’s brand new Training Centre, which was developed by WING, the leading Hungarian real estate company, is one of Europe’s most advanced aviation training centres equipped with two Airbus A320 CAE 7000XR Series full-flight simulators. As part of a 10-year agreement, CAE is also providing training centre operation services to Wizz Air by operating and maintaining the training equipment suite for the airline at the new facility. The training centre will also have a cutting edge Cabin Emergency Evacuation Trainer by TFCas well as a V9000 Commander Next-Generation Fire Trainer by Flame Aviation. It is an integrated centre where all pilots and cabin crew training can be carried out. Accommodating up to 300 trainees per day at full capacity – coming from all over Wizz Air’s network – the region’s newest training centre is able to host classroom training as well as flight and cabin simulation exercises. Initial and recurrent ground training and type ratings are also part of the training offered. The new Training Centre hosts the Wizz Air Pilot Academy, launched in September in Hungary, which offers young and ambitious individuals with no or little flying experience the unique opportunity to obtain a Commercial Pilot’s License and the perspective of working as a pilot at Wizz Air. Within the framework of the program, WIZZ will support all cadets enrolled in the program and meeting certain terms and conditions, by pre-financing a significant part of their tuition fees in order to lower the barrier for them to start their career as pilots. The high-quality training, following Wizz Air’s standards, will be provided by contracted pilot schools. The opening of the new Wizz Air Training Centre represents a more than € 30 million investment, as well as an investment in world-class talents who are now able to reach their dreams of becoming pilots or cabin crew members at this ultra-modern complex, conveniently located in the heart of Central Europe, Budapest. Tamás Menczer, State Secretary for Information and International Representation of Hungary, said: “The Hungarian government set two main goals when it made international trade a priority of its foreign policy: to help domestic companies compete in export markets and to attract foreign investment to Hungary. Neither is possible without a robust transport infrastructure. As a small and open economy, it is vital that Hungary is easily and quickly accessible, and that's where Wizz Air plays a pivotal role as Central and Eastern Europe's largest airline. It is no coincidence that Wizz Air was named European Airline of the Year in 2017. We congratulate everyone who contributed to the building of this futuristic and impressive facility. It was a remarkable achievement to complete it within eight months. The success of Wizz Air is the success of the Hungarian economy so the company can continue to count on the government's support in economic, diplomatic and other areas.” .